Written by: Christopher Bond, Stephen Sondheim and Hugh Wheeler. Starring: Johnny Depp, Helena Bonham Carter, Alan Rickman, Sacha Baron Cohen. 116 min. R.
Review top sheet: Sweeney Todd: The Demon Barber of Fleet Street is dark, unnatural, gory and fundamentally revolting – and a musical. This makes for an interesting combination if you have a strong stomach or a very warped sense of humour and are at ease with people singing their way through life. Yes, if you like “texture” films – films which succeed at the level of overall feeling, rather than specifics – or just hate Sacha Baron Cohen. No, if you faint at the sight of blood. I’m not kidding: don’t go. Maybe, you would like to hear Johnny Depp doing a pretty convincing David Bowie impression. General comments: any film which calls itself Sweeney Todd: The Demon Barber of Fleet Street is not shy about its content, so lets get that out of the way: Sweeney Todd is a fictional character who appeared in English literature around the middle of the nineteenth century. He is a barber who – driven by vengeance for Life’s cruelties towards him personally – takes to slitting the throats of his customers. His accomplice, friend and lover – Mrs Lovett – chops up the bodies and makes pies of them which she sells. So, we have murder, collusion, vengeance, possible insanity and – oh, yeah – wholesale cannibalism. Personally, I’m alright with most of that list, but the cannibalism turns my stomach. Be warned: it's vile. The film looks amazing. The director (Tim Burton) cut his teeth on such films as Edward Scissorhands and Batman and knows how to give a picture atmosphere. The lighting, computer graphics, sets, make-up and costumes are, frankly, superb: dark, ghoulish, menacing and beautiful. Musicals have their own rules. They are not simply broken down into discrete pop videos (although that idea has been tried). They are more messy than that; songs are left unfinished and refrains repeat throughout the film. It’s more like a symphony where some motifs pop up in more than one act. When combined with set dance pieces – for example, Chicago – the result can be highly satisfying. Here, for some reason, it was not. There is something false about a character breaking either into or out of song, an insurmountable awkwardness. Film – by definition – requires suspension of disbelief. But the points where song is welded to dialogue puts a strain on my suspension of disbelief greater than I feel comfortable with. The highlight for me was Sacha Baron Cohen – whom you either like a lot or despise. I think he is very talented, although I don’t believe his is a talent the world would be the poorer for being without. If you are from Kazakhstan, this film will hold a particularly satisfying moment for you. I rate Johnny Depp highly. He puts himself into some interesting projects – some commercial and some not. His Dead Man, for example, is one of my all-time favourites. 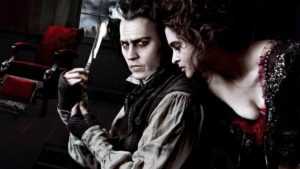 Sweeney Todd: The Demon Barber of Fleet Street is similar in that it is unpleasant in most of its specifics, but succeeds at the overall level of texture. Don’t expect to love it. But don’t expect to forget it in a hurry, either. Story comments: a strong enough story if you can get past the revolting nature of the content. Acting comments: I didn’t love the performances – mainly because I find musicals a bit annoying by definition. But I still found myself being impressed by the overall result. Substance comments: vengeance, inhumanity and unnaturalness – a combination sure to get the punters in. Film craft comments: beautifully made with magnificent sets, lighting and make-up. Top-rate work. A taste of the story: a man returns from forced labour abroad to find his wife gone and daughter made the ward of an evil judge. He responds by opening a barber’s shop and murdering all his clientele and singing a lot.